Produced by Pathe News, 1955. Queen Elizabeth II arriving at Morecambe station and being greeted by Lord Lieutenant of Lancashire, Lord Derby. She meets the Mayor of Morecambe Councillor Bryce Clegg, Duke of Edinburgh does likewise. Queen and Prince Philip leaving by car for Lancaster.Crowds outside Lancaster Town Hall. Crowds outside hall as queen comes out. Duke meeting tenants of the Duchy. Crowds at Preston. Mayor, Councillor Gray escorting the Queen from the platform. Royal party at Lancashire Constabulary at Hutton. 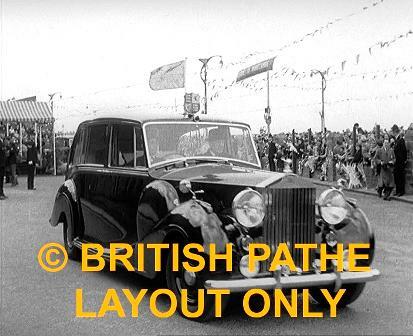 Queen and Duke on balcony at Southport, pan to cheering crowds, met by the Mayor, Alderman Mrs Edith Smith. Blackpool. Huge crowd in front of illuminations (night shots). Front of Opera House "Royal Performance". Queen walking into theatre escorted by Lord Lieutenant who presents the Mayor, Alderman Will Ogden and the Mayoress. Surging crowd outside theatre at night. Police holding back crowd as first aid men attend to casualties. After performance the Queen greeting radio and TV star Alma Cogan watched by band leader Jack Hylton. Queen and Duke meeting comedian Arthur Askey. Car arriving at Darwen (the next day) and children cheering. Queen and Duke of Edinburgh meet the Mayor, Mr Norman Briggs, his wife and Town Clark. Car arriving at Blackburn town hall. Guard of Honour, 4th Battalion, the East Lancashire Regiment, presenting arms. Interior, Mullards factory at Blackburn. Queen's car leaving, en route to Burnley. Royal party arriving at Town Hall, Burnley. The Mayor, Alderman J. Herbert, escorting Queen and Duke to balcony of Town Hall. Interior of Malvern Mill of Pollard Ltd. in Nelson.